If there was a defining moment from the opening race of the Formula One season, it was not Jenson Button’s whoops of joy as he sprayed second-placed Sebastian Vettel with his winner’s magnum of champagne, it was third-placed Lewis Hamilton’s deathly stare. The Englishman may have congratulated Button on his win at Albert Park, he may have said all the right things, but to lose to his team-mate after starting on pole cut to the quick. We could almost hear Hamilton asking himself: could it possibly be that Button’s second-place finish last year, 43 points and three places ahead of Hamilton, was a taste of the future rather than an aberration? Such a question would have seemed absurd back in 2010 when Jenson Button, fresh from limping over the finishing line to win his first world championship with Brawn GP, joined McLaren. Button had a well-worn track record of making disastrous career choices and even joked that he was entering Lewis Hamilton’s “den”. The drivers, commentators and fans, however, were virtually unanimous in their opinion that Hamilton would eat his compatriot alive. After all, in five years in Formula One, Hamilton had never finished the season behind a team-mate, and had even bested world champion Fernando Alonso in his rookie year. Hamilton seemed to take his likely superiority as read and, for many people, it seemed less a question of whether the younger man would prevail and more of whether Button’s efforts to live with his searingly quick team-mate would provoke the sort of fireworks that characterised the last time two world champions duked it out for the McLaren team. Comparisons with fiery Brazilian Ayrton Senna and cool-headed Frenchman Alain Prost were an easy shorthand, partly because they were so near the mark. Hamilton, still acknowledged to be the naturally fastest driver on the grid, was cast in the role of Senna – emotionally flawed, at war with authority, a man with a self-destructive streak of hauteur and a considerable conceit of himself. With his laidback bonhomie and charm, plus his professorial personality and silky-smooth driving style, Button was cast as Prost, and he certainly has the same inner steel and deeply competitive nature. The apparent closeness of their relationship – or at least their ability to not fall out, even after Button shunted Hamilton out of the Montreal Grand Prix last year – is particularly surprising considering how emphatically Button beat Hamilton in the 2011 Drivers’ Championship. As the season wore on, Button put in one outstanding performance after another while a disconsolate Hamilton, who had never expected to come under such unrelenting pressure from his team-mate, began to feel the heat. At one stage, team principal Martin Whitmarsh openly wondered whether Button’s consistency was getting to his team-mate, a suggestion Hamilton angrily refuted as “rubbish”. Nevertheless, nobody else seemed inclined to argue with Whitmarsh’s assessment that “the first driver you want to beat is your team-mate – they are there to beat each other and Jenson’s been on a run, so Lewis is under pressure”. Button also endeared himself to many people in the team. McLaren’s decision to give Button a three-year contract while Hamilton’s deal runs out at the end of the year was a further, uncomfortable reminder that the newcomer has made himself very much at home in Hamilton’s den. Button has his own theory on how he has avoided conflict with Hamilton. “We don’t spend any time together,” he said. “It’s the easiest way, really.” Button has also drawn clear lines in the sand, demanding equal resources and making it clear that he will walk away from McLaren rather than submit to team orders. There is also another reason why the dynamic between the two drivers was always going to be fundamentally different to that between Hamilton and any other driver. When Hamilton made his motorsport bow at the Rye House kart circuit in Hertfordshire as an eight-year-old, his role model was a lanky teenager winning every event, right up to being the youngest European Super A champion. Nor was being Hamilton’s polestar Button’s only role: when Hamilton’s father Anthony was struggling to raise enough money to fund his son’s karting career, it was John Button, Jenson’s father, who stepped in and supplied him with the engines he needed to keep competing. Indeed, if anything, Hamilton is actually trying to learn from his team-mate. 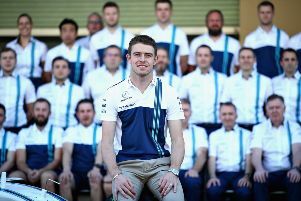 Last year the conspicuously solitary driver alienated many in the team, sport and media through his argumentative, sullen and angry behaviour, not to mention crashes and penalties. His unhappiness was due in part to his split from long-distance girlfriend and Pussycat Dolls singer Nicole Scherzinger just before the Indian Grand Prix, and to the acrimonious split with his father and mentor Anthony, who was unceremoniously sacked by his son in 2010. For Button, however, true happiness would come in beating Hamilton while winning the world championship. Scorching ahead of his team-mate off the grid in Melbourne was a good start but, with 19 races to go and Malaysia favouring Hamilton, the fun and games are only just starting.